Sounds great, and I guess it is a landmark of some kind but in the real world it doesn’t have much value. My sketches reached one million views today on my Flickr Page. As of today, February 6th 2018, I have posted 974 sketches on the Flickr site and surprisingly enough the first sketch I posted was drawn on February 5th 2013 - so exactly 6 years ago. So I am going to take a minute here and do a bit of bragging, and for those who know me well, know this is nothing out of the ordinary . . . I often exhibit traits of smugness and conceit. And I am indeed feeling a bit frisky today so here goes. As I mentioned I started sketching back in February of 2013. I had some really nice Canson paper left over from a project at work and cut it up and made a small 5 inch by 5 inch sketchbook. I started sketching on odd days before work.. I discovered an online sketch challenge - 75 days of sketching every single day and in ink only, no pencil! So I took up the challenge and at the end of the 75 days I had developed the habit of daily sketching before work. My work day started at 7:30, an dit is over a half an hour to where I worked at the time so I would leave the house early, mostly around 5ish in the morning to give myself plenty of time to sketch and paint before work. All of my sketches on my Flicker page are from direct observation with very few exceptions..there are a few works I did in my studio from sketches and photos but they amount to a very small percentage. Since retirement I have gotten out of the daily habit I am sorry to say..gotta work on that discipline thing… So here is a smattering of images. My most viewed image. . .Painted exactly one day before I retired. The image above is my most viewed sketch. These are thing you can never second guess. I am always amazed what is liked, viewed and commented on. This is a nice little sketch but I’ll be darned as to why it has so many more views that the others. This is a favorite location that I like to go to before work, Arcadia Management Area..beautiful woods and trails and always something fresh to paint. My most recent, the tree in my front yard. The sketch above is of the old tree in my front yard. I am thinking it will be coming down soon as it has a lot of rotten bits…but last year it still was in full leaf. We will see what happens this spring. I love trying to work out values of light and dark when sketching in ink and the complexity of this tree and the play of sunlight made for a good challenge. The above image is one of my personal favorites. It was painted from the front seat of my car one foggy December morning. Down beyond those distant trees is Browning Mill Pond. There is a great trail around the pond which is just over a mile in length. Carol and I have hike this trail a couple of times and I made the trek around the pond several times in the early hours before work. I have seen plenty of beaver sign around the pond but have never seen a beaver. . go figure. Another of the sketches I am fond of is this snowy morning. Again from my front seat on a very cold morning. Most of the back roads I typically travel at this time of day hadn’t been plowed yet so I parked in the parking lot of the local CVS Pharmacy and found this scene and some good morning light. 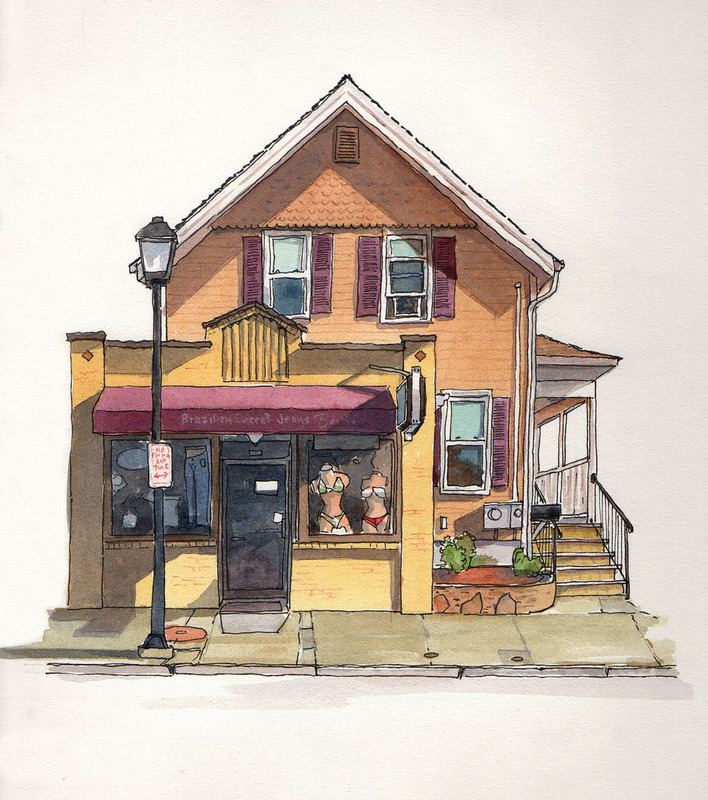 I also love to sketch architecture and New England has an abundance of great old buildings. The sketch above is about as close as I come to sketching known landmarks. Slater Mill is “The birthplace of the industrial revolution’ - although there are many in England who would dispute that. I do love working in ink, it is such a complete departure from watercolor. The Badlands of Alberta, Canada, where the dinosaurs are. . . I also like to sketch when we travel. This is a sketch of the Badlands in Alberta, Canada I did when we drove the TransCanada Highway in 2017. This is near the town of Drumheller which is home to the best dinosaur museum ever..we were going to stop at the museum for an hour or so and continue on to Calgary but ended up staying in Drumheller for nearly three days. Another travel page. This was such a nice beach on St. Thomas, near where we were visiting with friends. It is always nice to get away to somewhere warm during the cold winter months here in New England. A little house a few blocks away from home. 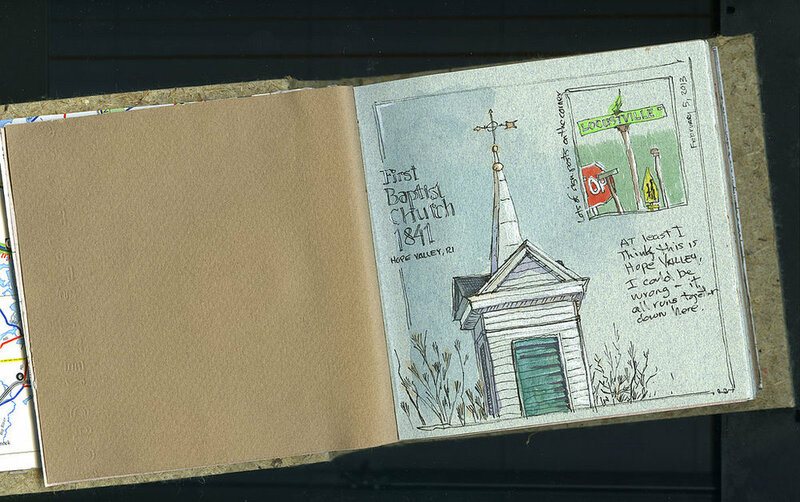 I’ll finish up this drivel with a recent sketch of a little house near home. I have admired this little house for quite some time and finally put it down on paper. I’m guessing gnomes live here. . . So if you like these sketches then feel free to visit my Flickr page and view a few hundred more as I start my quest to reach 2 million views. . .